Q: Some equipment for the THAAD system has been delivered to the ROK for deployment. What is China's response to that? A: We have noted the latest development. China's position on the issue of THAAD is fairly clear and I will not repeat it here. What I want to stress is that we are resolutely against the deployment of THAAD by the US and the ROK in the ROK, and will take firm and necessary steps to safeguard our security interests. All the consequences entailed shall be borne by the US and the ROK. We once again strongly urge the relevant parties to stop the deployment process, instead of traveling further down the wrong path. Q: I am with Reuters. I have a question about the Dalai Lama. In an interview with the US comedian John Oliver, the Dalai Lama said that Chinese hardliners "have no common sense" on the issue of Tibet. Do you have a response to this? A: I have seen the report, on Reuters actually. The program mentioned in the report is a talk show for entertainment, where the Dalai Lama tried to sound funny and humorous. However, his words are all lies that do not accord with the facts. You must be clear with the Chinese government's position on Tibet-related issues and comments on the Dalai Lama, so I will not repeat them here. We have said many times that the 14th Dalai Lama is a political exile engaged in anti-China separatist activities under the disguise of religion. Now it seems that he is also an "actor" whose performance can be rather deceptive. Q: German Ambassador to China Michael Clauss said in an interview on March 6 that although the Chinese leadership sent out signals of supporting free trade and level playing fields, the US, Japan and European countries all feel the same that there's growing protectionism in China. How do you respond to that? A: We have been saying that economic cooperation and trade between China and other countries, including Germany, is mutually beneficial in nature. Obviously, China and Germany have achieved positive progress in bilateral trade over these years, creating tangible benefits for companies and people from both sides and boosting each other's economic growth. According to the German side, China became Germany's largest trading partner last year for the first time. I wonder how the German Ambassador came up with the idea. Premier Li Keqiang pointed out a few days ago in the government work report that China will make big moves to improve the environment for foreign investors and open wider to the world at a higher level. As two major economies, China and Germany share common interests in and should work jointly for a level playing field and liberalization and facilitation of trade and investment. Q: Last night the expelled Ambassador of the DPRK to Malaysia arrived in Beijing. I wonder if Chinese officials had any contact with him. Second, today the DPRK announced that they banned Malaysian citizens from leaving the country. And Malaysia later banned officials from the DPRK Embassy from leaving the country. I wonder if China has any comment on that and if China is willing to help ease the tension between the two countries. Has China had any contact with the DPRK? A: On your first question, to my knowledge, Kang Chol, Ambassador of the DPRK to Malaysia arrived early this morning in Beijing, and is waiting for his trip back to the DPRK. On your second question, we have noted the latest development. It is hoped that relevant parties will properly deal with this matter in a responsible manner under the framework of international law. Q: Over 20 Lotte Mart stores in China have been shut down due to fire safety concerns. Analysts said that China is taking countermeasures against Lotte because of THAAD. Do you agree with that? A: I took a similar question yesterday. Our position on the issue of THAAD is clear and firm, and there is no need to repeat. We have said multiple times that the Chinese government welcomes the investment and operation of foreign companies, including those of the ROK in China, and will protect their lawful rights and interests in accordance with the law, but their businesses should abide by Chinese laws and regulations. Q: New fighting erupted yesterday within the Kokang region of Myanmar. Is there any report of damage in China? Is China trying to mediate between the two sides to bring an end to this fighting? A: The Chinese side follows closely the military conflict in the Kokang region. The situation in Northern Myanmar concerns peace and tranquility in the border areas between China and Myanmar. Parties concerned should stop fighting immediately so as to prevent the situation from getting worse, and restore normal order in the border areas as soon as possible. 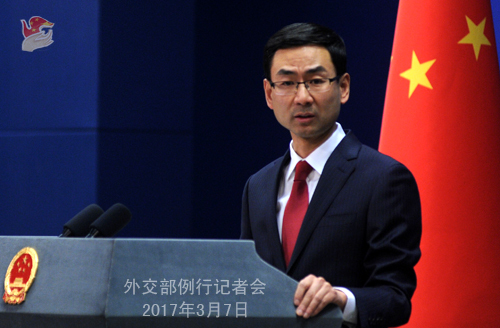 The Chinese side supports all measures conducive to peace. Parties concerned should stay committed to peacefully resolving their differences through dialogue and consultation. Since the outbreak of the conflict, some Myanmar residents living in the border areas have crossed over to the Chinese side for safety reasons. The Chinese side has offered them assistance in the spirit of humanitarianism. Q: Could you tell us anything about the coming visit by US Secretary of State Rex Tillerson? A: As I said yesterday, the Chinese side welcomes the visit by State Secretary Tillerson when both sides are convenient. China and the US are communicating on relevant matters. Q: An ROK official said that the ROK should lodge a complaint at the World Trade Organization about what it sees as trade protectionism by China against ROK companies. Also, the ROK media report that China has again rejected applications for ROK airlines to add charter flights to China. Do you have information on this? 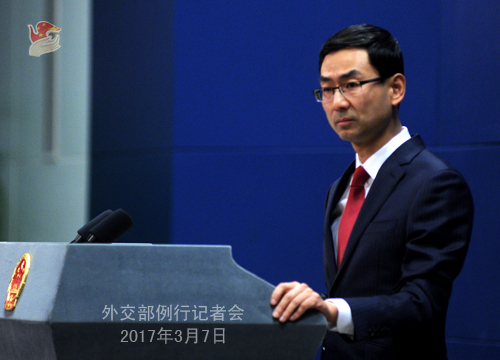 A: On your first question, I want to say something about the "complaint", that is, the Chinese government welcomes the investment and operation of foreign companies, including those of the ROK in China, and protects their lawful rights and interests in accordance with the law, but their businesses should abide by Chinese laws and regulations. China acts in complete accordance with the law and relevant regulations. I am not aware of what you said in your second question. Q: Were Chinese citizens killed or injured in the military conflict in the Kokang region? Separately, has the Chinese side lodged representations with the US and the ROK for the deployment of THAAD? A: On your first question, I have not received any report of Chinese casualties in the conflict. On your second question, we are against the deployment of THAAD by the US and the ROK in the ROK, and will take resolute and necessary measures to protect our security interests. We have told the US and the ROK our position on multiple occasions through various channels. Both of them are very clear about where we stand. Q: Is China willing to play a bigger role to prevent the situation on the Korean Peninsula from worsening? A: As a major country in Northeast Asia and a responsible member of the international community, China has been working relentlessly for and making contributions to the settlement of the Korean Peninsula nuclear issue as well as peace and stability of the Peninsula. Our efforts have been recognized and commended by the international community. The situation on the Peninsula remains sensitive and complex. We urge relevant parties to keep calm, exercise restraint, and avoid any action that may provoke each other or even escalate the tension. We also call on all parties to join us in pushing for an early restart of negotiation and play their due roles for the settlement of the issue through dialogue and consultation. Q: Do you know when the DPRK Ambassador to Malaysia might leave China? A: I just said that Ambassador Kang Chol arrived in Beijing early this morning and is waiting for the trip back to the DPRK. 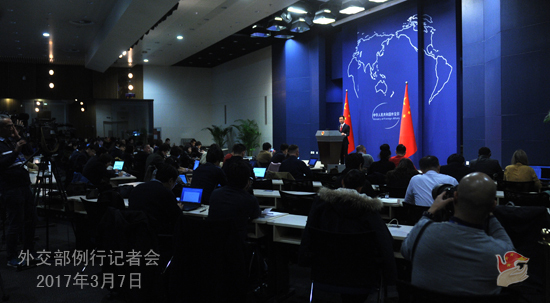 Foreign Minister Wang Yi will meet the press at the press center of the "two sessions" on March 8. 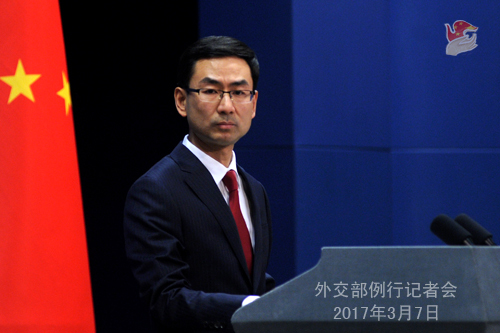 The regular press conference of the Foreign Ministry will be adjourned on that day, and resumed the next day. The online media registration system and the official website of the media center for the Belt and Road Forum for International Cooperation (BRF) will be open on March 10. Further information can be found on the website of the International Press Center (IPC).